What’s the Association Factor and Why Is It a Painting ‘Must’? I don’t want to learn how to paint from just anyone. I don’t mean that snobbishly, but I know how I work and learn. I am a visual learner and I learn by doing. Hearing someone drone on and on makes me want to get up and run around the room, so my best art instructors are those who can demonstrate the oil painting techniques they want me to learn. If they are making a point about still life, I’d like to see some still life paintings as examples. Basically: don’t just tell me, show me! An instructor also needs to have her or his own point of view. I’m not interested a generic workshop experience. I want to hear about the personal experiences and original ideas from the artist I’m learning from. They also have to put me at ease, too. I’m already kind of tense about drawing and painting; I need someone to balance that. On all fronts, oil painter C.W. Mundy is a really good instructor for me. I was on set with him when he was shooting his DVD, Mastering the Dramatic Still Life, and I found that he is funny, patient, he’ll listen, and then he tells you what you need to know. But most of all he’s got his own ideas. C.W. has developed what he calls the “7 Foundational Truths” of painting. He says one of those truths is the “Association Factor,” and that is what this featured clip from Mastering the Dramatic Still Life is all about. to get your copy instantly! Now you can take your pieces further with how-tos on: drawing, squinting, design, value, color, edges, and paint manipulation in the must-have DVD Mastering the Dramatic Still Life with C.W. Mundy.Join internationally renowned artist C.W. Mundy as he demonstrates his techniques for creating a vibrant still life from start to finish. Enhance your skills and discover expert advice from arranging your subjects to ensuring each piece’s overall harmony through C.W’s 7 Foundational Truths. Give your pieces a more powerful effect with tips on making careful choices when placing your subjects. Create atmosphere and dynamic sense of space in your still lifes that rivals any landscape painting. Save time and stay focused when painting with tips on premixing colors. Find your artistic voice with essential instruction in this brand-new Artist Daily Workshop DVD. 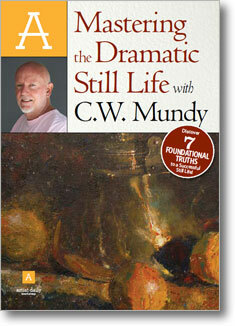 Order your copy of Mastering the Dramatic Still Life with C.W. Mundy today! Join C.W. Mundy one-on-one for essential still life instruction. Connect with your canvas even more with tips for visually striking pieces. Follow along with easy-to-see up-close views of each stroke. Express your vision with these master techniques you’ll use again and again.